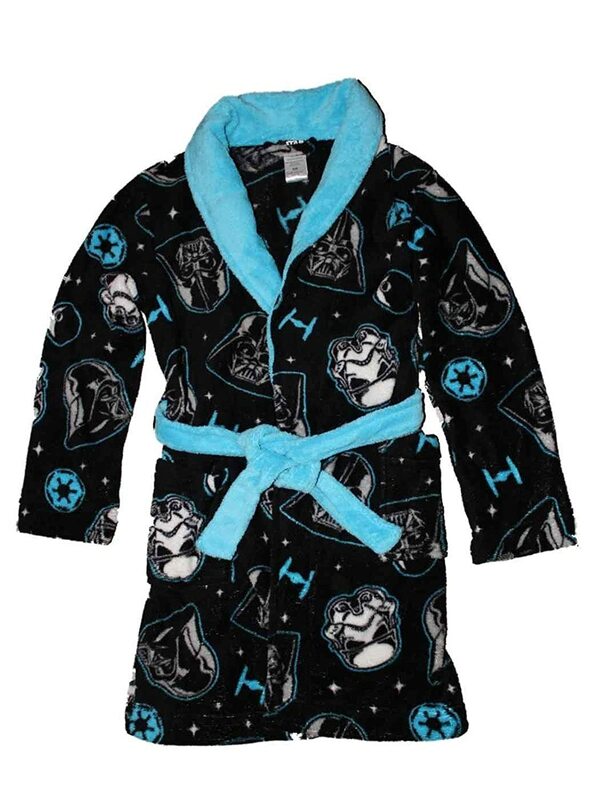 Star Wars bathrobes for kids come modeled on cool characters like Darth Vader and Jedi knights. 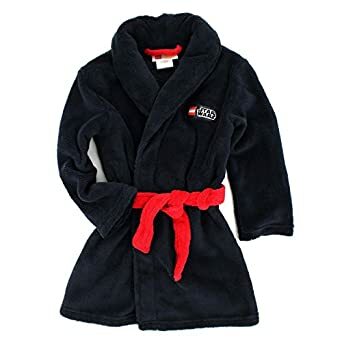 Younger fans of the science fiction hit Star Wars and, more recently, The Force Awakens and Rogue One, should love having their own soft, fleece bathrobe based on these movies. These kids robes come in a number of varieties and types. You can often find Jedi Sith or Yoda designs which are both characters that kids may enjoy pretending to be. ⭐ My daughter enjoys putting her geeky bath robe on and especially in the winter months so she can get warm fast. 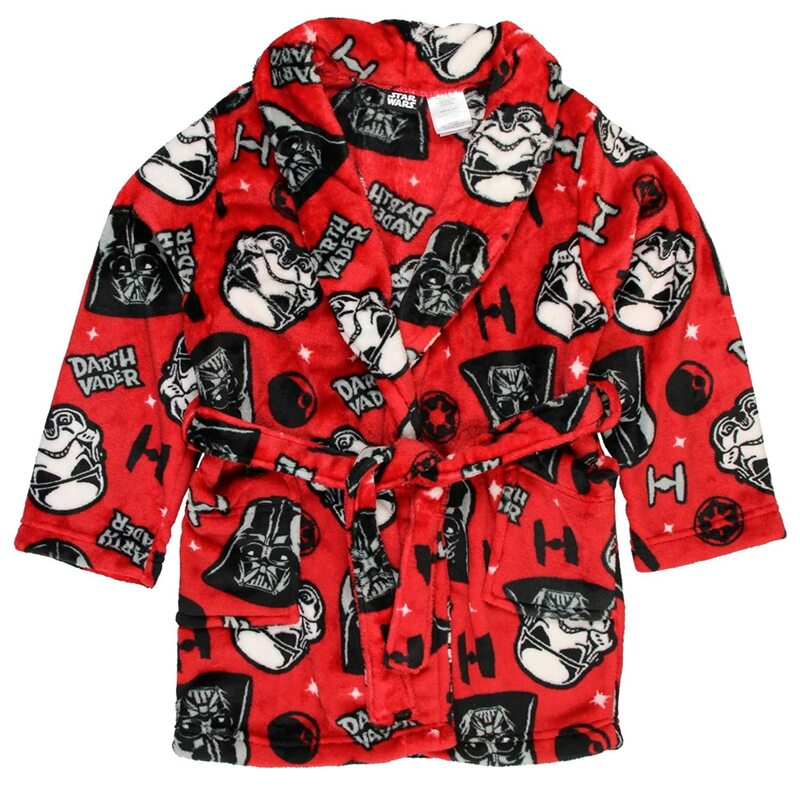 The range of Star Wars bathrobes for kids really has a number of uses which makes them much more of a versatile and practical buy. You can use a separate robe and keep it just for using at the pool, beach or after playing in the garden sandpit because it can get chilly when the sun goes in. We have used ours for all kinds of dressing up opportunities as well as for bedtime and bath time to snuggle up in. So buying two can be pretty handy if your budget allows for that. With a major public disappointment in the new baddie character of Kylo Ren in The Force Awakens, there is still a massive amount of interest in the bad guy from the original and classic series: Darth Vader. There are not many boys, I believe, who will be aspiring to look like Kylo Ren. However, this striking looking black robe is surely everything you’d want for looking like the tough guy Sith Lord who deals in dark forces. 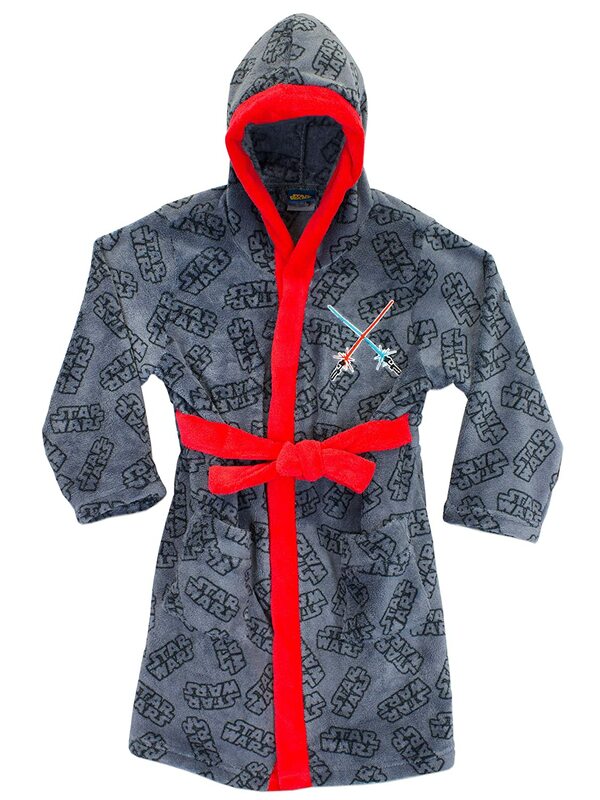 It is a Lego Star Wars bathrobe in black with red accents such as belt tie. On the back of the design, which is shown in the photo, is an embroidered Darth Vader character with his name in red. Some of these very cool looking and cleverly designed bath robes are not only functional as a dressing gown, robe or housecoat but can also be used for dressing up and even costume play just perfect for Halloween too. 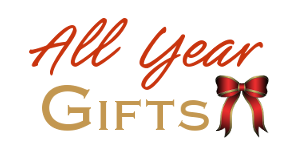 So your purchase can stretch a long way. I like the very striking design on this one which features an allover logo design with an eye catching red belt and stripe down the hood and front. It features a colorful red and blue lightsaber design on the front which has been embroidered and also the wording Star Wars on the back. 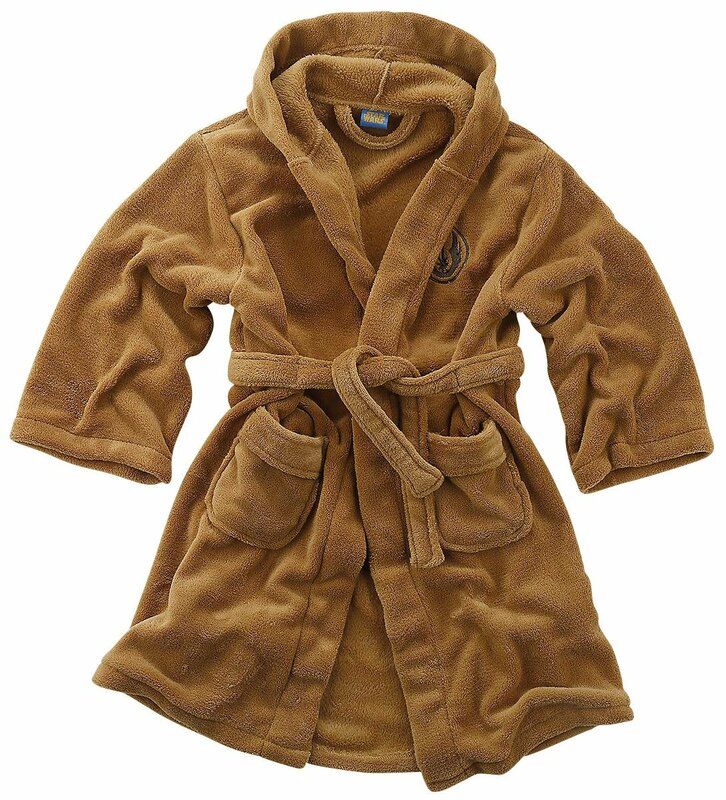 Although they are sometimes hard to find for children, you can get hold of a soft and snugly looking hooded Jedi Knight fleece robe which should be perfect for younger Star Wars fans. The cool feature on these robes (not pictured) is the nice big pointy hood and also the Jedi symbol detail. Kids can pretend to be a Jedi in training when they put this on to wear. It isn’t just a robe, it’s a dress-up costume too. It should be a big hit with children who enjoy playing as hero sci-fi characters. Equip them with a toy lightsaber too and they are all sorted. 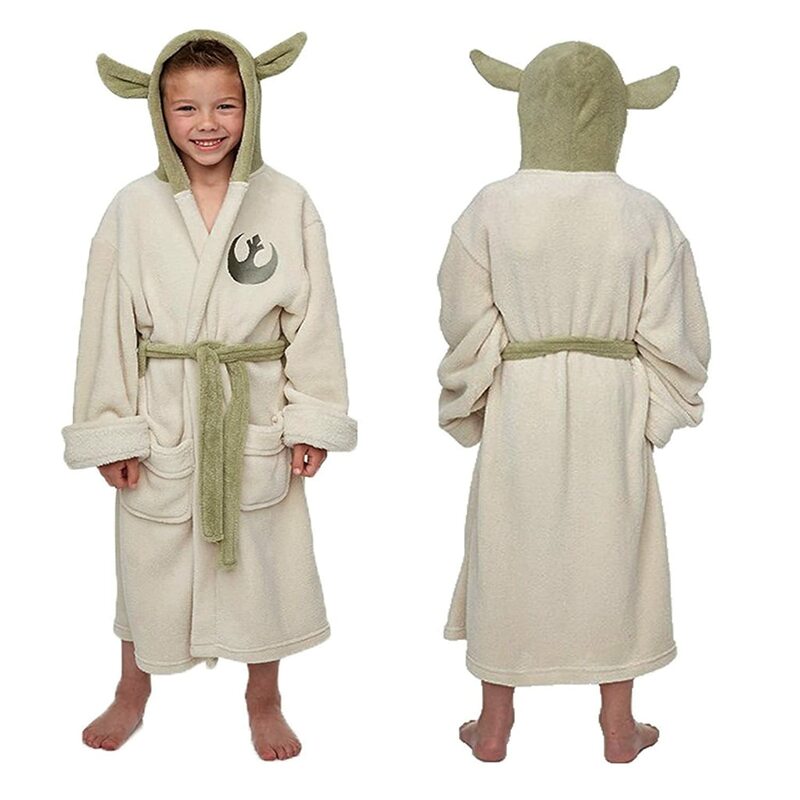 Master Yoda is a really cool Star Wars character and children should not be disappointed with a soft fleece bathrobe that comes with Yoda ears on the pale green hood and the Star Wars rebel alliance symbol on the front too. The pale creamy color robe has two pockets and comes with a matching green wrap belt. All you need is to add on a Yoda green lit toy lightsaber to provide a child with countless hours of role play and dress-up fun. The only problem might be trying to get the robe off them at the end of the day. Jedi lightsabers are mostly blue but they can also be green. The Star Wars character Luke Skywalker started out by having a blue one which he used to battle with against Darth Vader who preferred the red. Kylo Ren has a red one with 3 colored blades on it. Seeing as kids love to role play and costume play wearing these unique robes, a rather cool accessory to add on is a lightsaber. Master Yoda’s lightsaber is green. Enjoy dressing up as Yoda, kids will. And then they may want a green one to play imaginary duels against the evil forces of the Empire such as Count Dooku and Emperor Palpatine. Official Yoda lightsabers are often harder to get and more expensive, so look for a toy green version to complete the dressing up fun! Want to know how you can make your own very inexpensive and child friendly toy lightsabers? Buy a suitably colored pool noodle, cut it down to size (normally in half) and wrap some silver color duct tape around one end to make a pretend handle for it.